Debutant Grant Ward scored a hat-trick as Ipswich edged a thrilling second half to ensure Barnsley's Championship return ended in defeat. Half-time substitute Ward struck with a low drive 30 seconds after coming on, a goal cancelled out by Conor Hourihane. Ward soon smashed in his second and David McGoldrick converted a penalty to put Ipswich in control. Marley Watkins' header gave Barnsley hope before Ward added his third with a late low drive. Midfielder Ward, a summer signing from Tottenham, was introduced at the break by manager Mick McCarthy following a first half in which Barnsley created the better chances, Adam Hammill going close from 30 yards and Bartosz Białkowski saving superbly from Tom Bradshaw. And he completely transformed the match, his three goals in 38 second-half minutes making him an instant Portman Road favourite. His team's other goal, McGoldrick's penalty, came after Andy Yiadom fouled Daryl Murphy. There were signs of encouragement for Barnsley boss Paul Heckingbottom, who led his side to promotion as caretaker manager last season but was taking charge of his first game since being given the job on a permanent basis. 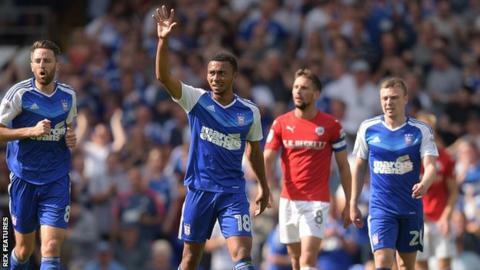 But despite Barnsley twice fighting back to put themselves in contention, it was Ipswich who put the disappointment of last season's seventh-placed finish behind them to start the new season in positive fashion. "After last season, I wanted my midfielders to score more and I thought Grant Ward had a goal in him - I didn't know he had three in 45 minutes. "They were three great strikes and we are all delighted for Grant. He has impressed everyone since he arrived. "We have brought in fresh blood and hopefully the crowd feel entertained - though at the end of the first half, they might have thought about leaving." "You have seen the difference there. There were lots of positives we can take from the game when we review it, but they have had six shots and scored four times. "The message in the dressing room is that we have to learn from that, both in terms of the goals we conceded and the clinical nature of Ipswich. "The goals we conceded were disappointing, we were slow to get out and stop shots, and we wouldn't normally concede like that. I can guarantee we won't as the season goes on. "The players know they can cope at this level and that they belong here, while we had more than 1,000 fans who were fantastic. They know they have a team who give everything." Match ends, Ipswich Town 4, Barnsley 2. Second Half ends, Ipswich Town 4, Barnsley 2. Attempt saved. Stefan Payne (Barnsley) right footed shot from the left side of the six yard box is saved in the bottom left corner. Assisted by Adam Hammill. Attempt blocked. Adam Hammill (Barnsley) right footed shot from the left side of the box is blocked. Assisted by Aidan White. Andy Yiadom (Barnsley) wins a free kick on the right wing. Foul by Conor Grant (Ipswich Town). Attempt missed. Alfie Mawson (Barnsley) right footed shot from outside the box is close, but misses to the left from a direct free kick. Attempt missed. Josh Scowen (Barnsley) right footed shot from outside the box is high and wide to the right. Assisted by George Moncur. Goal! Ipswich Town 4, Barnsley 2. Grant Ward (Ipswich Town) left footed shot from outside the box to the bottom right corner following a corner. Corner, Ipswich Town. Conceded by Alfie Mawson. Substitution, Ipswich Town. Brett Pitman replaces David McGoldrick. Attempt blocked. Adam Hammill (Barnsley) right footed shot from outside the box is blocked. Assisted by George Moncur. Marley Watkins (Barnsley) wins a free kick in the defensive half. Goal! Ipswich Town 3, Barnsley 2. Marley Watkins (Barnsley) header from the centre of the box to the top left corner. Assisted by Conor Hourihane with a cross following a set piece situation. Josh Scowen (Barnsley) wins a free kick on the right wing. Substitution, Barnsley. Stefan Payne replaces Ryan Kent. Substitution, Barnsley. George Moncur replaces Tom Bradshaw. Delay in match Grant Ward (Ipswich Town) because of an injury. Attempt saved. Conor Grant (Ipswich Town) left footed shot from outside the box is saved in the top centre of the goal. Assisted by Freddie Sears. Attempt saved. David McGoldrick (Ipswich Town) left footed shot from the left side of the box is saved in the centre of the goal. Assisted by Grant Ward. Attempt missed. Alfie Mawson (Barnsley) header from the centre of the box misses to the left. Assisted by Marc Roberts. Ryan Kent (Barnsley) wins a free kick in the defensive half. Corner, Barnsley. Conceded by Adam Webster. Conor Hourihane (Barnsley) wins a free kick in the defensive half. Offside, Ipswich Town. Conor Grant tries a through ball, but David McGoldrick is caught offside. Goal! Ipswich Town 3, Barnsley 1. David McGoldrick (Ipswich Town) converts the penalty with a right footed shot to the bottom left corner. Penalty conceded by Andy Yiadom (Barnsley) after a foul in the penalty area. Penalty Ipswich Town. Daryl Murphy draws a foul in the penalty area. Goal! Ipswich Town 2, Barnsley 1. Grant Ward (Ipswich Town) right footed shot from the right side of the box to the bottom right corner. Conor Hourihane (Barnsley) is shown the yellow card for a bad foul.